This is a list of the gross National debt that countries have. National debt refers to the amount of total government debt a country has. This is also referred to as ‘public sector debt’. It is compiled using data from the IMF, Eurostat and CIA agencies. Note: National debt is different to ‘External debt‘ – External debt includes all the debts a country (both private and public sector) owe to foreigners. Levels of general gross government debt. Debt levels as % of GDP for 2017. Canada National debt gross debt 85% of GDP (2012) Net federal debt involves only central government. (38% of GDP). Why is Japan able to borrow so much at low interest rates? An important factor is not just cumulative national debt, but, the annual budget deficit. This annual deficit determines the rate of deterioration in the public sector debt. The budget deficit is the total amount the government needs to borrow in a particular year. 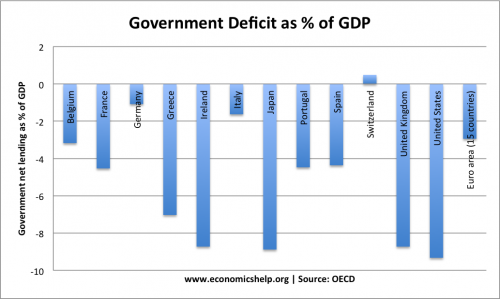 This shows that the US has one of the highest budget deficits in the world. How can debt increase, but debt to GDP fall? What is difference between debt and deficit?